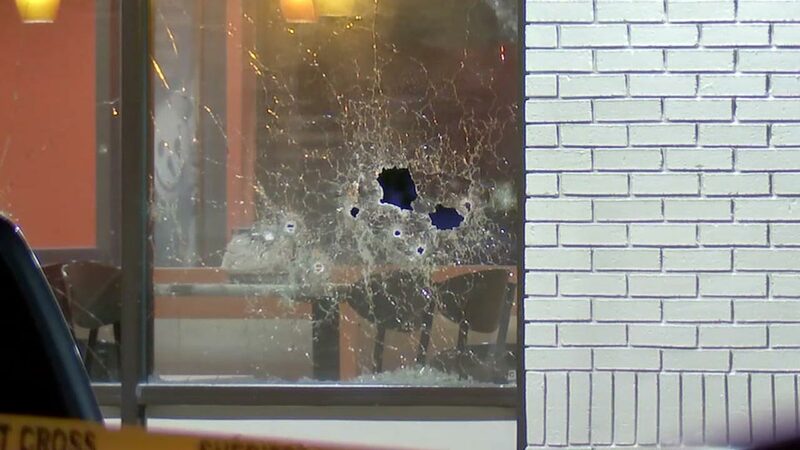 Families of suspects in restaurant shootout question deputy actions. HOUSTON, Texas (KTRK) -- Shattered glass and dozens of markers surrounded the Jack-in-the-Box restaurant earlier this week. Now, the families of those involved are facing the aftermath. Angela Wilson, mother of a teen suspect killed, talked about the shooting. "I just wish my child would have had a chance, arrest them, put them in jail and let them think about the consequences instead of me having to bury my child," Wilson said. Sheriff's deputies said the teens involved were wanted for about 10 aggravated robberies in the area, including two at nearby gas stations where an employee described the terrifying experience. Witnesses describe hearing up to 45 shots at the Jack-in-the-Box in northwest Harris County. A joint task force had been watching them when the car pulled in to the restaurant around 9:40 Monday night at Highway 6 and FM 529. The young men were seen running towards the restaurant in bandanas and hoodies. Two are accused of pulling guns and demanding money. Sheriff's deputies said the suspects were ordered to drop their weapons and surrender, but they fired at them and a gun battle started. The shootout ended with the death of a 16-year-old. Another teen was injured, two were not hurt and appeared in court. They are charged with aggravated robbery with a deadly weapon. "Young man is dead, my son is in the hospital, and two more facing whatever charges. All this could have been prevented if they would have just stood up and got the guys in the lot and pulled them over," the father of one of the injured teens said. Relatives and community activists claim some witnesses said the suspects never fired at police. "They never shot. They had been surveillancing them, why not pull them over. Why come to this point," Quanell X said. The families said they don't condone the behavior, but they have questions they want answered. "To other young men thinking about something like this, let this be an example of why you should never do something like this," added Quanell X.